Above - A signed photograph of Will Evans in his early years - Kindly sent in by his Grandson Bill Evans. 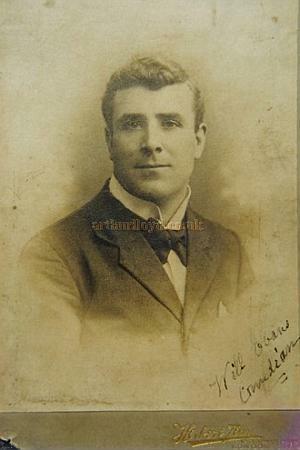 Will Evans was a well known name in Music Hall and Pantomime in the late 1800s and early 1900s. He was the son of Fred Evans, a clown in the Grimaldi tradition. Fred Evans is known to have performed in a benefit for W. Holland, along with Arthur Lloyd, and many big names of the day, at the Surrey Theatre in February 1880. Will Evans is often said to have made his first appearance with his father when aged just six years old in a production of 'Robinson Crusoe' at the Theatre Royal, Drury Lane in 1881, however, I have a copy of Will Evans birth certificate which clearly states that he was born on the 29th of May 1866 so the year for this event is clearly wrong and I can find no mention of it in archive newspaper reports of the time. 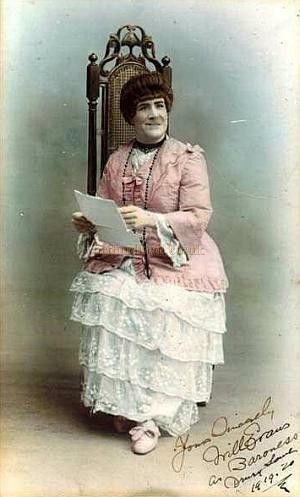 Right - Will Evans in costume as the Baroness in a Drury Lane Pantomine in 1920 - Kindly sent in by his Grandson Bill Evans. Signature reads: Yours sincerly Will Evans as Baroness Drury Lane 1919 - 20. Anyway, Will Evans went on tour with his father's comedy company for many years before returning to London in 1890 to perform in the Music Halls with his first wife Ada Luxmore. After she died he carried on as a solo artiste and comedian. His specialty was playing in comic domestic dramas, now better known as farces, the most popular of which were `Building a Chicken House', 'Whitewashing the Ceiling', and 'Papering a House'. He was often to be seen in the Theatre Royal, Drury Lane's regular Christmas Pantomimes. Evans was also the co writer of a play called 'Tons of Money' along with Archibald Pechey. The play was written in 1914 but was not seen on stage until 1922 at the first Shaftesbury Theatre in London. It subsequently transferred to the Aldwych Theatre where it became the first of a series of successful farces. 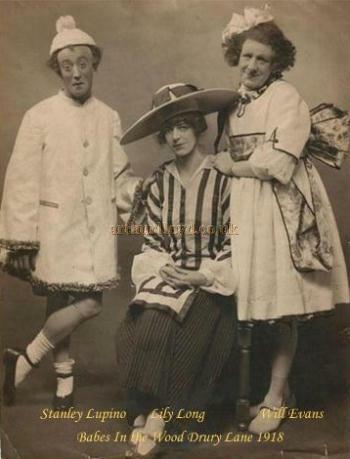 Left - Stanley Lupino, Lily Long, and Will Evans posing for the camera and in costume for the Drury Lane pantomime 'Babes in the Wood' in 1918 - Kindly sent in by Will Evans' grandson Bill Evans. It has also come to light recently that Will Evans also co-wrote a play called 'The Other Mr Gibbs' with R. Guy Reeve (shown right). It was a typical farce in the Aldwych style, involving a man called Mr. Gibbs who wants to attend a meeting about a gold mine he has put all his money in to, but at the same time needs to be at a family meeting with his wife's mother about her proposed will. The plot involves him hiring a music hall actor to impersonate him at the family meeting and the farce descends into cases of mistaken identity and the wife not knowing who her husband is. Right - A photograph of Guy Reeve, co-writer with Will Evans of 'The Other Mr. Gibbs' - Courtesy Jason Mullen, Reeve's maternal Great Grandson. 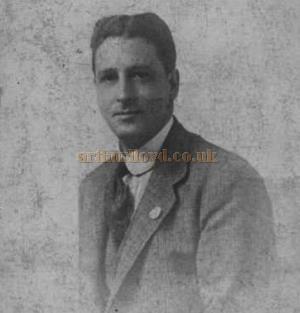 In the biography of the Theatre producer J. Bannister Howard, who produced the Aldwych Farces, he says:- 'During a visit to Manchester with my Florodora company in 1921 my wife and I were sitting one evening in the midland Hotel, when Will Evans and his wife entered. Will had been playing at the Ardwick Empire. He came up to me and said "Hullo Bannister will you read a farce of mine if I lend it to you?" "ok" we took the script upstairs to bed and I was just dozing off when my wife began screaming with laughter. "What on earth is the matter" I said, she replied this is the funniest thing I have ever read". 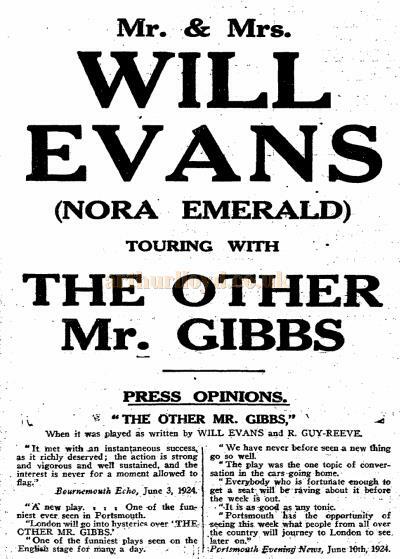 Left - An advertisement in The Stage of July 24th 1924 for Will Evans and his wife Nora Emerald on tour in 'The Other Mr. Gibbs' - Courtesy Jason Mullen. In a later chapter Howard says: - "I wish I could say that I followed up Ton's of Money with a similar fortune maker but alas such plays do not fall from heaven too often- at least not in these days. I thought I was onto another good thing when I secured another farce from Will Evans. This was "The other Mr. Gibbs" which I staged at the Garrick with a fine cast which included Robert Hale, Mary Brough, and Kate Cutler. It made money but I regret to say it was not another Ton's of Money" - J. Bannister Howard 'Fifty Years a Showman' published 1938 Hutchinson. Will Evans wrote many of his own songs and sketches for his appearances in the Music Halls and became a much loved part of the Music Hall scene. He died in 1931. 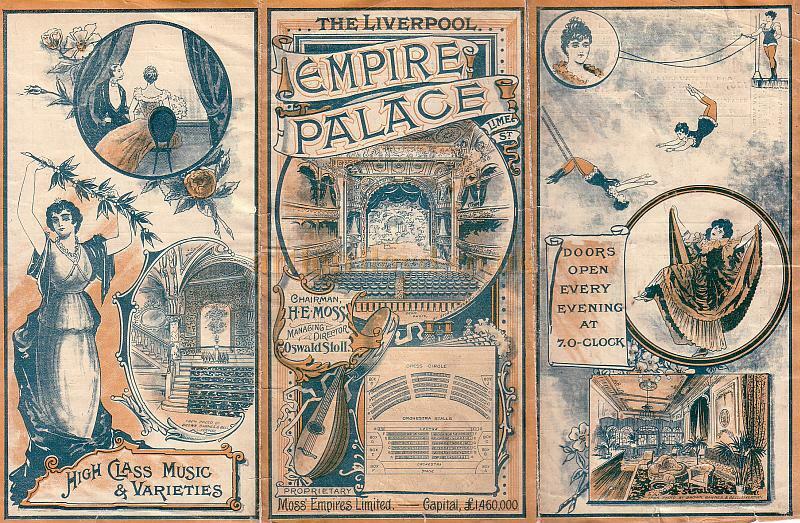 Above - A Variety Programme for the Empire Palace Theatre, Liverpool for the week of November 27th 1905. On the Bill were George Lashwood, Will Evans, Hanid Alexander, The Wedburns, The Bandurrias, Pat Carey, Billy Farrell, Fred Clements, O. G. Seymour, and the American Bioscope.